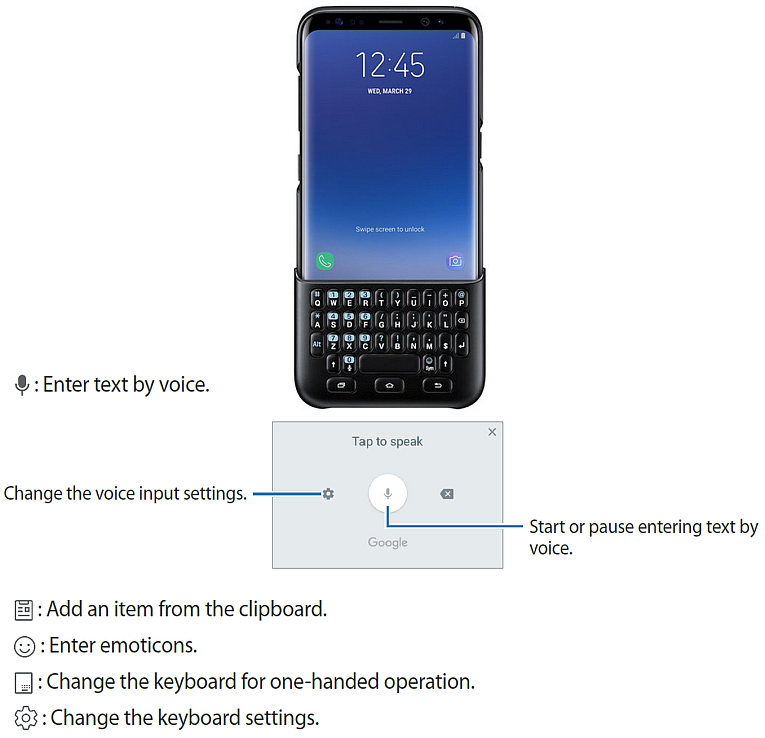 Galaxy S8 Keyboard Guide - A keyboard Samsung Galaxy S8 or Galaxy S8+ appears automatically when you enter text to send messages, create notes, and more. 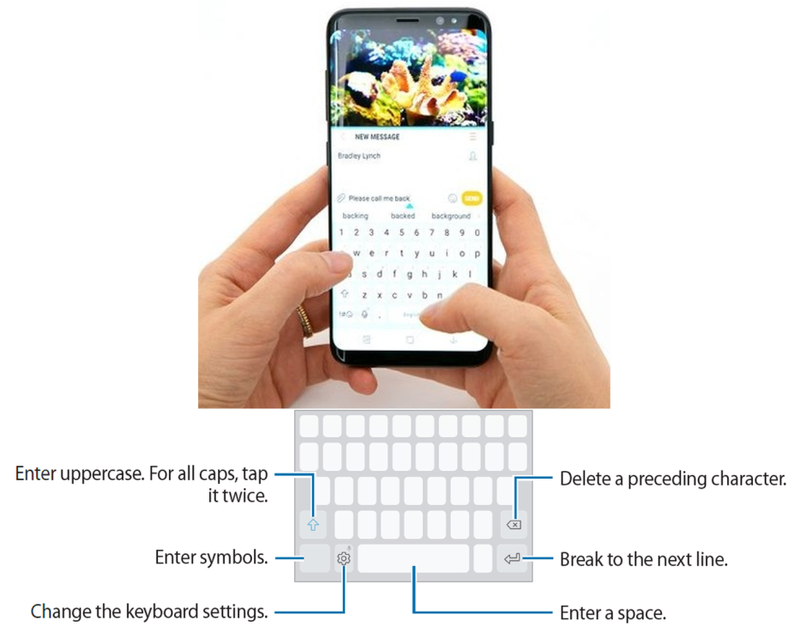 Read this Galaxy S8 Plus Manual to manage Galaxy S8 Keyboard, customize, functions, layout, settings, tips and tricks. Enter uppercase. For all caps, tap it twice. Tap → Languages and types → MANAGE INPUT LANGUAGES, and then select the languages to use. When you select two or more languages, you can switch between the input languages by swiping to the left or right on the space key. Tap → Languages and types, select a language, and then select a keyboard layout to use. On 3x4 keyboard, a key has three or four characters. To enter a character, tap the corresponding key repeatedly until the desired character appears. Other Galaxy S8 keyboard icons may appear instead of the icon depending on the last function that was used. Mic : Enter text by voice. Start or pause entering text by voice. Clipboard : Add an item from the clipboard. One Hand : Change the keyboard for one-handed operation. Gear : Change the Galaxy S8 keyboard settings. Tap and hold to use various Galaxy S8 keyboard functions. Tap and hold over text. Drag or to select the desired text, or tap Select all to select all text. Tap and hold where the text is to be inserted and tap Paste. Look up Samsung Galaxy S8 tips and tricks definitions for words while using certain features, such as when browsing webpages. Tap and hold over a word that you want to look up. If the word you want to look up is not selected, drag or to select the desired text. Tap Dictionary on the options list. If a dictionary is not preinstalled on the device, tap Move to Manage dictionaries → next to a dictionary to download it. View the definition in the dictionary pop-up window. To switch to the full screen view, tap . Tap the definition on the screen to view more definitions. In the detailed view, tap to add the word to your favourite words list or tap Search Web to use the word as a search term. Detachable QWERTY full-size, ergonomic keyboard features an exclusive key layout with shortcuts. Pairing or separate battery not required. Simply clip the keyboard to the front of your device with the included protective cover installed, your screen interface adjusts automatically to accommodate the keyboard. Store the keyboard on the backside of the protective cover when not in use. Experience new Galaxy S8 keyboard features fast and efficient typing with the slim and incredibly protective official black keyboard cover from Samsung for the S8. With no Bluetooth connection or power required, the keyboard case won't drain your battery or require charging. Get more done with this Official Samsung QWERTY keyboard case, allowing you to type more accurately and with greater speed. The ultra-thin design of this keyboard case makes it incredibly compact and lets you take it anywhere with you, ideal for use on the go, at home or in the office. The Samsung S8 Keyboard Cover contains specialised hot keys for convenience and efficiency. The Galaxy S8 hot keys offer a quick way to access your emails, music, calendar, contacts and web browsing, allowing you to get to the stuff you love quicker than ever before. 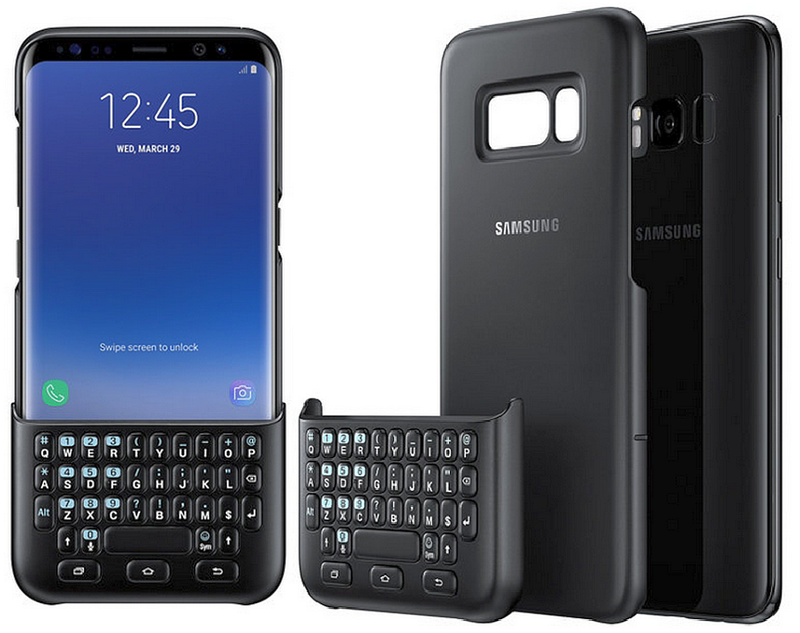 The Official Samsung Keyboard features a sturdy design that secures your smartphone and protects it from damage, such as scratches, knocks and drops while on the move. This Samsung Keyboard Cover is incredibly simple and easy to pair with, saving you time and maintaining a stable connection with your Samsung Galaxy S8. With no Bluetooth connection required unlike many other similar devices, the official keyboard cover wont drain your Galaxy S8 battery when in use. While many Bluetooth keyboards require power, which also means constant charging, the official keyboard cover works without needing any power at all, allowing you to always have fast and efficient typing at your fingertips without the worry of you're keyboard's battery running out mid text or email. Specifically designed for the S8, this Official Keyboard Case ensures full compatibility with your tablet, giving you a perfect typing experience every time.